Just did a replacement on my racor (10 micron) and the first fuel filter on the side of the motor. 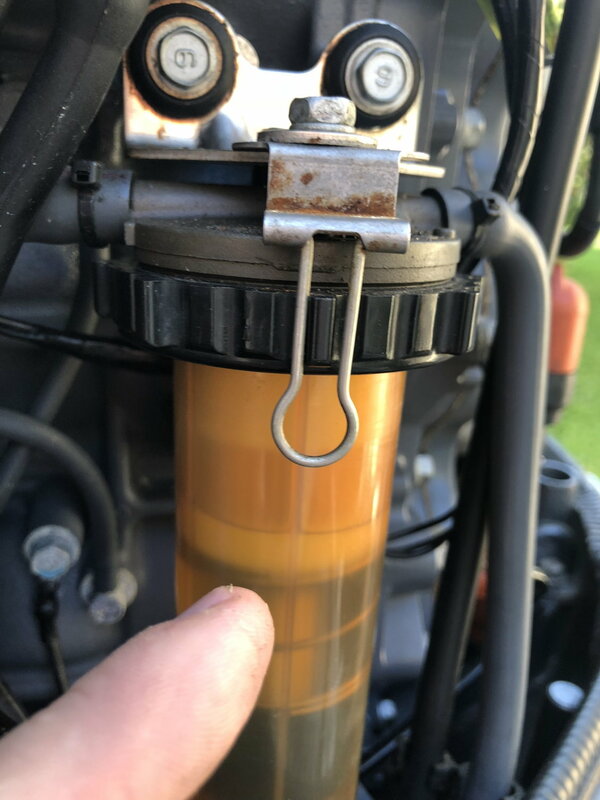 When I shut the motor off the clear fuel filter bowl on the side of the motor is full. When on or running it drops to about 75% at idle. Question is: is this normal? Where does the motor Draw from the filter or bottom of the bowl? or two but if this isn’t right I’d rather figure it out now. Don’t know what I could have done wrong simple as drop bowl change filter and pump prime bulb right? see photo this is at idle. You are drawing air from somewhere ( may just be from opening the bowl and some air got into the lines). I dont have the HDPIs but I do have the OX66s that have the same water separator filter. EVERY time I change filters I have the same issue. So far not problems and after a few hard runs it stays full. I don't think its abnormal. Same thing happens when I change my Racors. Engines have never missed a beat. i tightened the racor by hand and kept going till I couldn’t go anymore - that’s fine right? I always get worried about not tight enough then too tight. Last edited by General Disarray; 03-21-2019 at 05:05 PM. Completely normal for the gasoline level in that filter bowl to be where it is. Pump the primer ball to bleed all air from the filter bowl. Go and use the motors. The fuel level will go back down to where it was when you started. Air in the bowl does not matter. Any air in the fuel will be vented when the gasoline gets to the vapor separator tank. That is what the vapor separator tank does. got it was just worried the draw may come down too low for the pickup but I assume the pick up is at the bottom of the bowl and not the actual filter?